> Arrests were made in the investigation into the murder of Marion Grice's brother. > Navy backup QB Rafi Montalvo is recovering from a major car accident. > Former Arizona State recruit Angelo Richardson being paralyzed six years ago, his scholarship honored, and now he assists with the team. > The future of dominant ASU DT Will Sutton. > Navy's season in review. > The game being played at the home of the World Series champion San Francisco Giants. > Numerous promos and some sales obligations. 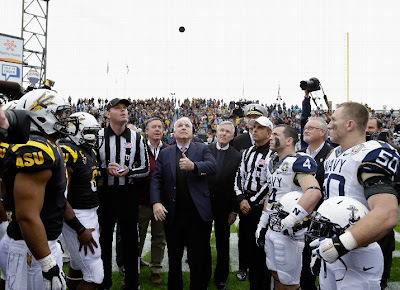 Next time we'll have to do soundbites too, because there was nothing left for the 4th quarter, except tape of the game's opening coin toss. Yes, while Washington sits on the precipice of a fiscal cliff (CLIFF! ), Senator John McCain, USNA '58, was flipping an Oreo. I'd call this a self-serving political photo-op, except it's an awesome photo. The home state he serves in the US Senate hammered his alma mater, but guess what - he wins either way. Sorta like being in politics.